Breaking: CreateSpace is requiring all customers to move to Kindle Direct Publishing! I’ve been a happy customer of CreateSpace for three years, and this was, to say the least, unexpected. Perusing the differences between Kindle Direct Publishing and CreateSpace and Kindle Direct Publishing’s FAQ on the topic I was relieved to see that, for me at least, this is not a major upset, with one exception. Namely: Kindle Direct Publishing (KDP) takes twice as long to pay you your royalties! There are numerous other small differences that don’t seem to affect me — but your mileage may vary, so check out the above links for a complete description of the differences between CS & KDP. You can’t avoid this change. KDP says that they will start moving books from CS “automatically” in “the next few weeks”. I took a deep breath and clicked on the link on my CS page to move my books over to KDP. The process went smoothly and within a few minutes, my books moved from CS to KDP. To my initial alarm, my books appeared with blank covers, and there was no way to order author copies! I sent an email message to KDP help, and they responded this morning with a generic unhelpful message repeating the website instructions on how to order author copies. However, when I checked my KDP page this morning, I saw the book covers. And the option to order author copies had appeared. Phew! Perhaps the full move takes a few hours, though KDP didn’t mention this in the move instructions. In retrospect, it might have been better to wait until KDP moved my books themselves. As my books are no longer on CS, I will now have to put up with the longer royalty payment times. I could have continued to receive my royalties after 30 days if I hadn’t moved my books right away. In the end, though, this makes little difference. I got to explore the consequences of the forced move on my own schedule rather than KDP’s. I’m not yet ready to upload my next self-published book, so I can’t share what it’s like to create a new book on KDP versus CS. I expect someone will make this comparison before I’m ready to do so, but if not, I’ll write about it! Have you made the switch from CreateSpace to Kindle Direct Publishing? What was it like? Share your experiences in the comments below. 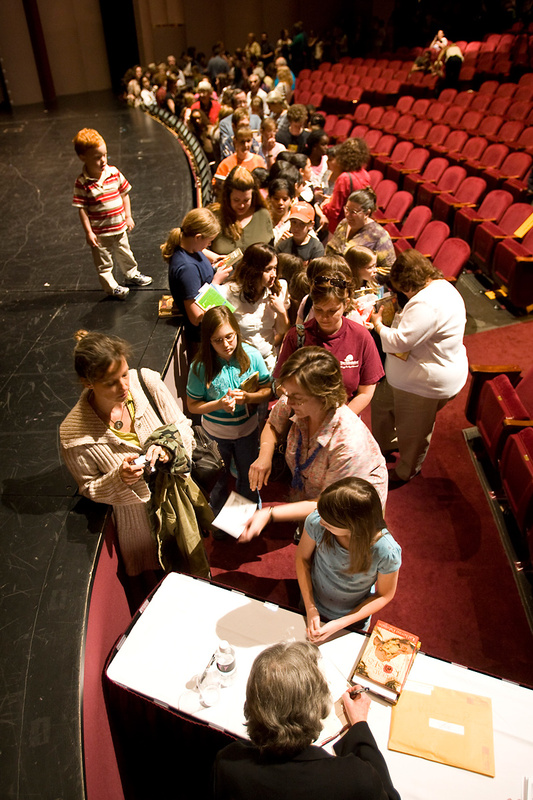 My book Conferences That Work: Creating Events That People Love has now been available for over five years in both paperback and ebook versions and is still selling well. 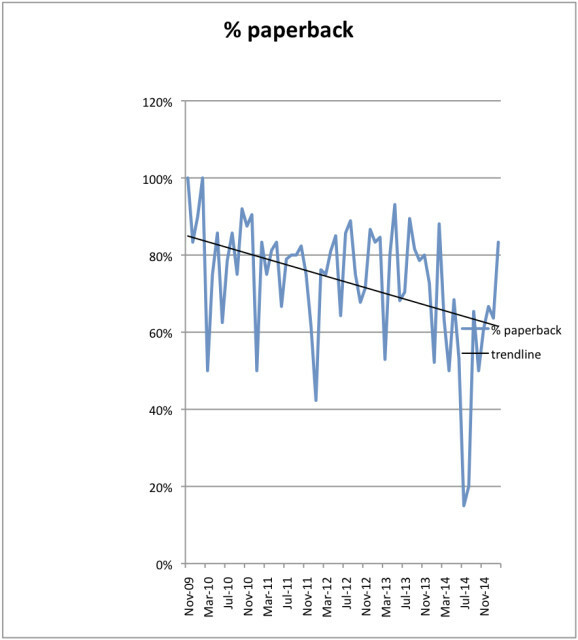 I thought it might be of interest to share how the proportion of paperback versus ebook sales has changed over time. The following figures include both indirect (mainly Amazon) and direct (my web store) sales. As you can see from the above graph, paperbacks were, on average, 82%, of sales when the book was published in 2009. Although there’s significant variation from month to month, due mainly to bulk sales of one format or the other, the five year trendline shows that by March 2015, the most recent month for which I have full indirect sales figures, paperback book sales dropped to just over 60% of all sales. The paperback is priced at $27.95 (Amazon) or $26.00 (from me directly), and the ebook format costs $11.00 (only from me). I haven’t changed any prices over the years, though Amazon plays tricks with the paperback pricing from time to time. These pricing levels provide me approximately the same income per copy for direct sales, regardless of the format. One factor that affects the quantity of new paperback sales is that, these days, there are usually a few used copies of the paperback available on Amazon for a few dollars under the new price. Sales of used copies reduces new copy sales. On the other hand, I expect some copies of the ebook get shared too. An additional trend I am noting for my website sales is that combination sales (both ebook and paperback versions of the same book) have been increasing over the last year. I offer a discount when both formats are purchased simultaneously, and this is worth considering if you are selling your books yourself. People still like paperbacks! Even though the ebook is 40% of the price of the paperback, I’m still selling more paperbacks than ebooks. The ebook format is becoming more popular over time. If, and that’s a big if, the trend continues, both formats will become equally popular some time in 2017. Interestingly, my new book The Power of Participation: Creating Conferences That Deliver Learning, Connection, Engagement, and Action which has only been available for three months has sold about equal numbers of each format to date. Don’t read too much into my experience. Conferences That Work is non-fiction, priced higher than most ebooks, and is only available as an ebook directly from me, so there’s no comparable Amazon sales channel. Your mileage may vary. Are you an author with book format sales history of your own? Feel free to share your experience in the comments below! Here’s the problem with self-publishing: no one cares about your book. That’s it in a nutshell. There are somewhere between 600,000 and 1,000,000 books published every year in the US alone, depending on which stats you believe. Many of those – perhaps as many as half or even more – are self-published. On average, they sell less than 250 copies each. Your book won’t stand out. Hilary Clinton’s will. Yours won’t. So self-publishing is an exercise in futility and obscurity. Of course, there are the stories of the writers who self-publish and magic happens and they sell millions of books, but those are the rare exceptions. How rare? Well, on the order of 1 or 2 per million. —Nick Morgan, Should You Self-Publish Your Book? Nick paints a realistic picture of the work required to become a “successful” self-published author—if you’re defining success purely in terms of book sales. But I think there are other perspectives to consider. My first book, about participant-driven and participation-rich conferences, was published three years ago. I have only sold a few thousand copies (though sales per year continue to rise) and the money I’ve made from selling books translates into a few cents an hour for the four part-time years I took to write the book. Not successful by Nick’s terms, right? But. During those three years I’ve moved from complete obscurity to become a fairly well known authority in the field of innovative event design. My blog had 2.25 million page views in 2012, I’m routinely presenting at industry conferences, and a typical consulting gig brings income that’s equivalent to selling five hundred books. If you are writing non-fiction for a niche market and you have something important to say, your book can provide wonderful exposure and authority that may (no guarantees!) translate into significant income. Traditional publishing typically adds another year before your book is published. I had complete control over the look and content of my book. I hired the same professionals—editor, proofreader, book designer, cover designer, copywriter—that major publishers use (they are often freelancers these days) and worked with them directly without the publisher as an intermediary. Although you’re very unlikely to make significant money from book sales, you receive significantly more money on each copy of the book. I have been able to build relationships with many of my book buyers. Although the paperback version of my book is available everywhere, I sell the ebook myself. Most of my sales come directly from my website, perhaps because I offer 30 minutes free consulting to anyone who buys the book from me. This allows me to connect one-to-one with my readers, which translates into additional consulting/facilitation/presenting work while building up a list of people who are likely be interested in my next book, due to be published later this year. I hope my experience and thoughts are helpful and perhaps encouraging for some who have been considering self-publishing.